With my interest in World War 1 shipbuilding, it was a short step to the end of the process - the Shipbreaking Industry. I collected notes from the few sources, including an article by Frank C Bowen from a gem of a book - the two volume "Shipping Wonders of the World" published in the 1930's. Because the book is long out of print and would not be available to many, I decided to transcribe the whole article. I would like to obtain permission, but have been unable to find the copyright owner. So the complete article with photographs follows. At the end are Additional Notes, including some from Frank C Bowen's story. In the days of the "wooden walls," a ship condemned to destruction was often burned or even carefully "lost" in some convenient spot. To-day the shipbreaking industry is run on scientific lines, and nothing is wasted. THE LAST OF A CUNARDER. The Servia, 7,392 tons gross, was broken up at Preston, Lancashire, She was built for the Cunard Line in 1881 at Glasgow. Her length was 515 feet, her breadth 52 ft. 1 in. and her depth 37 feet. Many old established businesses, engaged solely in shipbreaking and the disposal of the material, have extensive yards provided with the most up-to-date equipment. The Industry has been revolutionised by the introduction of the oxy-acetylene burner, which cuts through steel plating as if it were butter. As a rule, however, even the oldest ship has some value - in Great Britain, at least. There are many old-established businesses engaged solely in shipbreaking and the disposal of the material. This latter part of the business calls for great ingenuity. One of the pioneers was the firm of Castle, which started its shipbreaking business at the Baltic Wharf at Millbank on the Thames in 1838. The firm specialized in the breaking up of wooden warships there and as the size of ships increased, farther downstream. Turner's famous picture “The Fighting Téméraire" shows that ship being towed to Castle's yard. The timber of old, wooden warships, especially hard oak and teak, makes excellent material for garden furniture. It has wonderful weathering properties and is almost everlasting, needing neither paint nor varnish. It can be put to other purposes as well, as it was in 1922 when Liberty's, of London, rebuilt their premises and made excellent use of the oak from the old training ships Impregnable and Hindostan which had been broken up on the Thames. For many years Castle's took the greatest care of the figureheads of the ships which they broke up. When, after a long period of neglect, the Admiralty suddenly realized that such trophies were of great value to the morale of the Service, it was enabled to make the famous dockyard collections principally through the co-operation of the scrappers. A number of figureheads are stil1 to be seen at Millbank, and others have gone to museums all over the country. The late King George V was particularly interested in relics made from the material of old ships. On the breaking-up in 1910 of the cruiser Melampus, which he had commanded when he was Duke of York, he had a garden chair made from her teak for his own use and a suite of garden furniture for Queen Alexandra. Even today there is a big sale for articles, large and small, made from man-or-war teak; but in modern ships this material is virtually confined to the deck. Even in countries where labour is cheap, the materials of wooden ships could be profitably used again only when they were of oak, teak or similar timber. The majority of ships were of soft wood, which did not last for any time as garden furniture, but these were cut up into small pieces. Before the war of 1914-18 the shipbreakers could generally get £2 a ton for such wood to be burned as logs in open hearths. While labour was cheap this would show a reasonable return when combined with the sale of the metal fittings, hut the price paid to the owners had to he low. WEST COUNTRY "WOODEN WALL." H.M.S. St. Vincent was built at Devonport in 1815 and was broken up on the Thames in 1906. She had a length of 204 ft. 11 in., a beam of 54 ft. 7 in. and a displacement tonnage of 4,672. The timber of old wooden warships, especially hard oak and teak, is almost everlasting and needs neither paint nor varnish. It makes excellent material for garden furniture, and can even be incorporated in the structure of a new building. ON THE FIRTH OF FORTH, Shipbreaking at Bo'ness, West Lothian. The American liner Columbia, almost completely stripped of her fittings, is awaiting her turn to be broken up while men are dealing with the San Sylvestre (left), The Columbia, formerly the Belgenland, was built at Belfast in 1917. She had a gross tonnage of 27,132, and her main dimensions were: length, 670 ft. 5 in., beam 78 ft. 5 in. and depth 44 ft. 8 in. The San Sylvestre, of the Eagle Oil and Shipping Co., Ltd., was built at Newcastle on Tyne in 1911. She had a length of 420 ft. 6 in., a beam of 54 ft. 7 in. and a depth of 32 ft. 5 in. Her gross tonnage was 6,213. ONCE QUEEN OF THE ATLANTIC. The famous Mauretania, of the Cunard White Star Line, in the dock at Rosyth, on the Firth of Forth. Only one of her four funnels remains in position. Another, just removed, is lying on the deck. The Mauretania, and her sister ship, the Lusitania (torpedoed and sunk in 1915) were built for the Cunard Line in 1907. In that year the Lusitania took the Blue Riband of the Atlantic: from Germany with an eastward average of 23.61 and a westward average of 24.25 knots. In 1909 the Mauretania logged an eastward record at 25.89 and a westward record at 26.06 knots. This record stood for twenty years. The Mauretania, built at Newcastle on Tyne, had a gross tonnage of 10.696. Her length was 762 ft. 2 in., her beam 88 feet and her depth 57 ft. 1 in. SCRAPPED UNDER INTERNATIONAL TREATY, two British super-dreadnoughts at Cox and Danks' Yard, Queenborough, Kent. This photograph shows the deck of H.M.S. Orion, with H.M.S. Erin in the background. The Orion, a battleship of 22,500 tons displacement, was completed in 1912. She carried ten 13.5-in., sixteen 4-in. and four 3-pounder guns, in addition to three torpedo tubes. The battleship Erin had a displacement of 23,000 tons and similar armament, except that she had five torpedo tubes. She was completed in 1914. The scrap price of a warship is calculated at so much a ton displacement. Age has comparatively little effect on the price, but the condition of the plates is an important factor. The Admiralty takes adequate precautions against the divulgence of naval secrets by the sale of ships. NO LONGER A STATELY SHIP, the Cunard White Star liner Doric is in the hands of the shipbreakers at Newport, Mon. A crane is removing a section of the superstructure. The Doric, a twin-screw steamer of 16,464 tons, was built for the White Star Line at Belfast in 1923. She had a length of 575 ft. 6 in., a beam of 67 ft. 11 in. and a depth of 41 ft. 2 in. She was broken up in 1936. The ill fated French liner Atlantique being broken up at Port Glasgow, Renfrewshire. The Atlantique, which was condemned after she had caught fire in the English Channel, was built in 1930 at St. Nazaire, France. She had a gross tonnage of 40,945. Her length was 713 ft. 7 in., her breadth 91 ft. 9 in. and her depth 57 ft. 8 in. Passengers in the L.M.S. train, shown in the foreground drawn by an ex-Caledonian Railway express locomotive, obtain an excellent view of the process of shipbreaking. (text continued) Great Britain had a big start over her competitors in iron and steel shipbuilding on account of her natural resources, and many of the foreign shipbuilders were glad to buy British scrap to work into their new construction. Well over fifty years ago Denny Brothers of Dumbarton started to use forgings of scrap steel for their new ships and found that it answered perfectly. They began making the stems of all their seagoing steamers, a part of the ship which demands great strength, of scrap steel. They soon extended it to other parts, experimenting until stern frames up to a considerable weight could be made of scrap steel without difficulty or risk. THE AFTER END of a famous battle cruiser H.M.S. Lion. The flagship of Admiral Beatty at the battle of Jutland, she was among the warships scheduled for scrapping under international treaty. She was cut in two at Hebburn (Co. Durham), and the stern part was towed down the Tyne to Blyth (Northumberland), to be broken up. Because of a heavy ground swell, the stern part broke away from the tugs, but it was picked up again and the destination was reached. The photograph shows the crew hauling in the broken tow rope. H.M.S. Lion, completed in 1911, had a displacement of 26,350 tons and a speed of 30 knots. She was armed with eight 13.5-in. and sixteen 4 in. guns, in addition to two torpedo tubes. Formerly ships were broken up in dry dock whenever one was available, but that was expensive and nowadays this is done only in exceptional circumstances. The German ships salved at Scapa. Flow, for instance, are towed bottom upwards down to the dockyard at Rosyth, which is now almost disused, and there dealt with in one of the dry docks left idle by the departure of the fleet. As a rule the shipbreaking firm carefully selects the position of its yard, used exclusively for the purpose, with many factors in mind. It must be as handy as possible to the steel works to save transport expenses, for railway rates are heavy on pieces of any size and it is costly to handle them. The site must have a foreshore as long as the ships to be scrapped, and at high water sufficient depth for them to be floated in, although this demand is reduced by making the ship as light as possible and then driving her ashore at full speed. This is an impressive sight and the fact that it ruins the bottom of the ship is of minor importance. It has to be broken up anyhow. A 1O-feet rise and fall of tide is necessary, at least. The foreshore must not be exposed to the full force of the waves or the work would frequently have to be suspended. The best bottom is one that is hard and shelving, while the longer it dries at low water the better. These are the ideal conditions, but it is not always possible to find them in a convenient situation. Plates of hard steel up to 2 in. in thickness, and about 8 feet long, are within the power of the big shears, which cut through them with remarkable ease. Shell plates that can be detached from the hull entire and swung into the yard are there cut into convenient pieces. Sections that are too large cost much to transport but the breakers do not want to do any more work than is necessary for economy. In the old days there was an appalling waste in the process, for as a general rule the shipbreakers were interested only in the steel or metal for which they had a market, and anything else was disregarded. Really fine furniture, good for many years' service, was either smashed with an axe and fed into the furnaces, or else given as a present to anybody who cared to take it away. Many a waterman round the yards, made welcome to any odd thing that he cared to take away, has found a good market for it ashore. That, however was in the old days. Among the pioneers or the more efficient system of to-day was Thomas W. Ward, Ltd., whose business was founded by Thomas Ward at Sheffield in 1878. To begin with he was interested only in steel, but he loathed waste and set about eliminating it. Gradually the organisation grew until it is now one of the biggest in the industry. The firm has scrapping yards at Preston, Morecambe (Lancs), Grays (Essex), Milford Haven (Pembroke), Inverkeithing (Fife), Briton Ferry (Glamorgan), Hayle (Cornwall) and other places. With this magnificent organization the firm copies the example of the Chicago pork packer who boasts that he uses every part of the pig except the squeak. Every section formerly wasted is put to good use. The furniture has its regular market ashore and afloat. Many a tug or small passenger steamer carries the washbasin of some Atlantic queen of the past. Every item of auxiliary machinery - motors, pumps, and hundreds of other machines - is carefully taken down, cleaned and reconditioned by experts and sold for many years of further use. Recently there has been an additional method of finding a market for everything, and that is a wel1-advertised sale by auction or private treaty of everything that is portable, before the ship goes to the scrappers' yard. This was done with the famous Great Eastern nearly fifty years ago, and with one or two other particularly well known ships; but the custom was then allowed to lapse for many years. Obsolete men-of-war always contribute a large proportion of the material that comes on to the scrapping market. The progress of warship design is so steady, and the competition so keen, that the older ships are always going to the shipbreakers in a steady stream. Even when international agreement periodically postpones the bigger ships being cleared off the list by giving them longer agreed lives, the smaller vessels go to the yards in undiminished numbers. The scrapping of men-of-war is always worth while, so that there is the keenest competition to get hold of them. Before the war of l914-18 they were collected in batches in one or other of the anchorages popularly known as "Rotten Row" and periodically offered for sale by public auction. The bidding was supposed to be strictly controlled, certain ships being reserved for national buyers only, whereas others, of smaller importance, could be bought by anybody. The modern routine is quite different. All the sales are conducted by private treaty and any question as to the price realized, whether it is raised in Parliament or outside, is always met with the statement that its divulgence would be against public policy. In spite of the change, the scrappers are still as eager as ever for any warship that is on the market. There is a big weight of steel in her hull, and the breaker can usually rely on getting 60 per cont of her displacement in heavy scrap, and 10 per cent in light scrap. The proportions vary with the type of ship. Brass, copper, lead and cast iron are also yielded in considerable quantities, and the carefully-built watertube boilers and heavy bearings, all of the best metal to be obtained, show good profits. The expert eye of the scrapper assesses her value remarkably quickly – bronze propellers, metal in the engine-room, furniture that can be used again and a hundred and one other items. As industry revived, so the price revived as well, the passenger ships being always just a little ahead of the cargo vessels. The £78.000 given for the Mauretania worked out at £2 10s 10d a ton, gross, and the £100,000 which was given for the Olympic was £2 3s. a ton. If £2 a ton gross is given for cargo vessels the market is in a flourishing state. Shipbreaking is an industry which has grown vastly of recent years and has every chance of further expansion as the demand for steel appears to get bigger and bigger. To the lover of ships there is always something sad about a scrappers' yard where a beautiful yessel is ruthlessly cut up into lumps of dead material. UPSIDE DOWN IN DRY DOCK. The German battleship Konig Albert at Rosyth, Firth of Forth. This warship, completed in 1913, had a displacement tonnage of 24,120 and a speed of 21 knots. She had ten 12in., twelve 5.9in. and fourteen 3.4in. guns, in addition to six torpedo tubes. She was among the German warships scuttled at Scapa Flow in 1919. Raised by Metal Industries Ltd., after an immersion of nearly seventeen years, she left Scapa Flow on April 29, 1936, for Rosyth Dockyard. In Germany, numerous British warships sold for scrap have been broken up at the old Imperial Naval Dockyard at Wilhelmshaven. Although useful building material and parts from old ships have always been re-used, ships were more likely to be abandoned to fall to pieces in some out of the way place. What warship salvage did take place, was usually in the Royal Dockyards - Devonport, Portsmouth, Chatham, Sheerness, Pembroke Dock. See Royal Naval Dockyards. The pioneer of wooden shipbreaking and the re-cycling of material and parts was Henry Castle’s of Baltic Wharf, Millbank, on the River Thames in 1838, and later at Charlton and Woolwich. Turner’s famous painting “The Fighting Temeraire” shows her being towed to Castle’s yard. They specialised in wooden warships, and for example, Liberty’s of London, the famous shop, was rebuilt in 1922 using oak from Training ships Impregnable and Hindostan that were broken up on the Thames. Castle’s also kept the figureheads, which were later restored by the Admiralty and displayed at dockyards and shore establishments. This is at least the second case of scrapyard "dealers" doing a great service for British heritage that I am aware of. The other was Dai Woodham of Barry, South Wales who held on to over 200 steam locomotives instead of scrapping them. In the 1880’s, Denny Bros, of Dumbarton started using scrap steel in the building of new ships, and was followed by other steel-makers. A pioneer of iron and steel shipbreaking including the re-cycling of brass, copper, lead, cast iron, and all other useable material and parts was Thomas W Ward Ltd of Sheffield, founded in 1878. Ward’s first yard was at Preston, Lancashire in 1894 (or 1899). Another steel-maker who moved into shipbreaking was George Cohen around 1890. The first major warship scrapping was due to the First Sea Lord, Admiral Fisher, who championed the all-big gun Dreadnought. His policy was that ships "to weak to fight, too slow to run away" should be taken out of service. As a result, 154 ships were removed from the effective list in 1905. Many were sold for scrap, with the first 29 auctioned at Chatham Dockyard in April 1905, and sold for £138,000. Cox & Danks, Upnor (1922), Queenborough (1922), sold to Metal Industries in 1949. 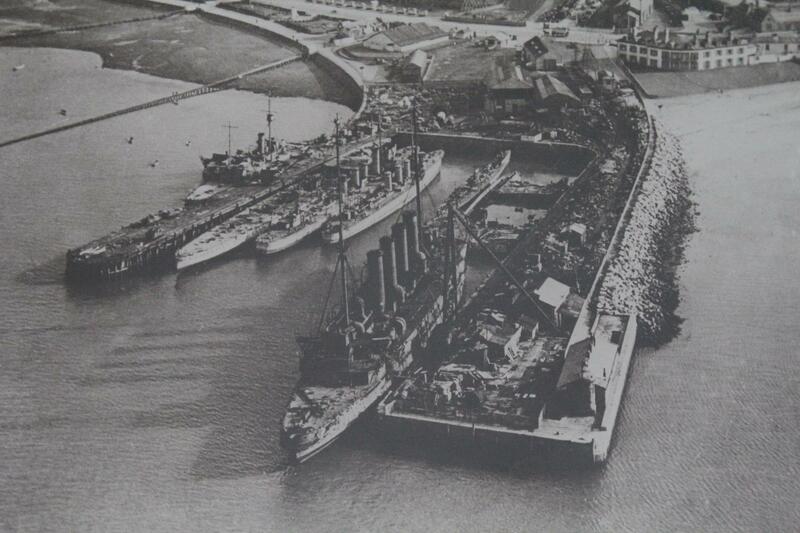 Queenborough yard broke-up dreadnoughts Orion and Erin in the 1920's. Demmellweek & Redding, Plymouth (1926). Forth Ship Breaking Co, Bo'ness (1906‑20), then McLellan (1922). Granton Ship Breaking Co (1919‑26). Hill, A. O, Dover (1929). Houston, J. W, Montrose (1923). Hughes, Bolckow, Tyne (1909‑23); Blyth (1912), also believed Jarrow. Blyth and Jarrow shared in the breaking-up of battlecruiser Lion in the 1920's. Lee, J. H., Dover (1919‑22) and Bembridge (1919‑20). Metal Industries, Rosyth (1930) and Charlestown (1935). Multilocular Ship Breaking Co, Stranraer, (1919‑22). Plymouth & Devon Ship Breaking Co, Plymouth (1926). Slough Trading Co (an agency for German buyers). Most naval shipbreaking was over by the mid-1920’s, although three British capital ships did not meet their end until the early 1930's - battleships Benbow by Metal Industries, Rosyth in 1931, Marlborough by the same company in 1932, and battlecruiser Tiger by Wards at Inverkeithing in 1932. The scuttled German capital ships raised at Scapa Flow (see "Cox's Navy") were broken up by Metal Industries at Rosyth in the mid-1930's. The only other major breaking was in 1936 when the Navy exchanged 34 old warships, mainly destroyers plus sloops Godetia and Iroquois with Ward's in part exchange for liner Majestic, which was converted to training ship Caledonia. Thereafter, there was little warship scrapping until post World War 2. During World War 2 the British Iron & Steel Corporation (BISCO) was formed, and most of the ships from then on were sold to this body and allocated to various yards for scrapping. This included 11 battleships and battlecruisers by 1949. Conway's "All the World's Fighting Ships"
That was an interesting challenge. I am 99% sure the large vessel in the foreground is 1st class cruiser DIADEM (466ft), sold 9/5/21, which would make the year 1921/22. I then looked for all British warships, destroyers and larger, scrapped at Wards, Morecombe in the early 1920's. The only problem is that Wards had lots of yards and ones sold to Morecombe may have ended up elsewhere and vice versa. probably ADVENTURE, scout cruiser, 395ft, 3/3/20, slim hull, scrapping already well advanced (75%). ALBION, old battleship, 420 ft, 11/12/19 her remains at and below waterline. Scale appears about right, but again I would have expected her gone by then. finally DIADEM - four funnels, two masts, squared off superstructure near stern. That only leaves EDGAR, 1st class cruiser, 387ft. I suppose she could be in the "ALBION" position, but demolition seems too far advanced compared with the other 9/5/21 sales. Maybe she's moored off picture or gone to another Ward's yard.